(JJ) I was warned when I first visited Harker's Yard that there was a certain amount of 'banter' between the apprentices. 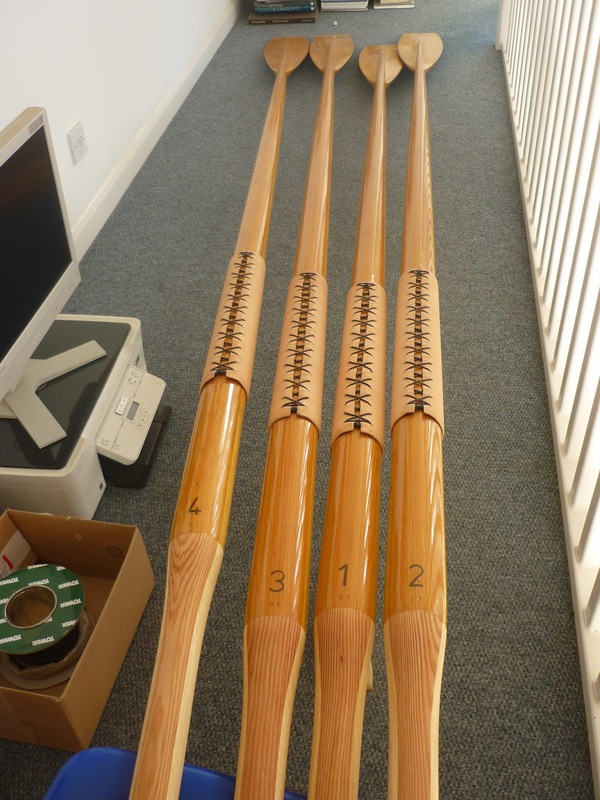 I began to get a flavour of that in The Great Oar Race (Liam's blog) so when I went to interview his rival, Jake, I wasn't entirely surprised when Jake pointed out that the final photo of oars on Liam's blog were actually HIS oars and also Liam hasn't yet finished (because he's making an entire extra set). Jake: Making the backbone is a fun, yet slightly challenging, job. There are nine components to the full backbone. Each has to be made separately and then it has to be put together like a big jigsaw puzzle – with only one piece being fitted at a time. 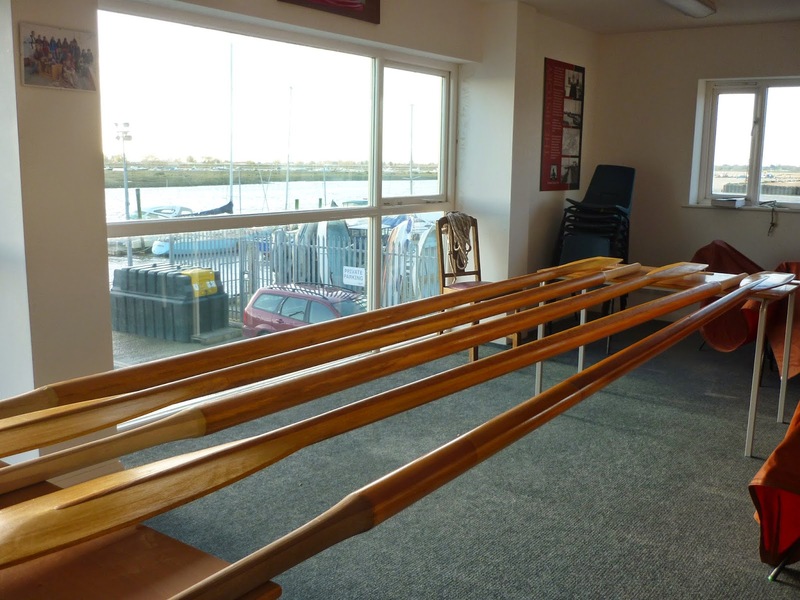 Jake: It also does help that I'm currently making a whole new set of oars whilst Aiden, who is working with me on the backbone, is repairing a broken oar from a previous set. I say he is working with me – actually there is an amusing dispute between me and Aiden about who is leading the operation to make the backbone. 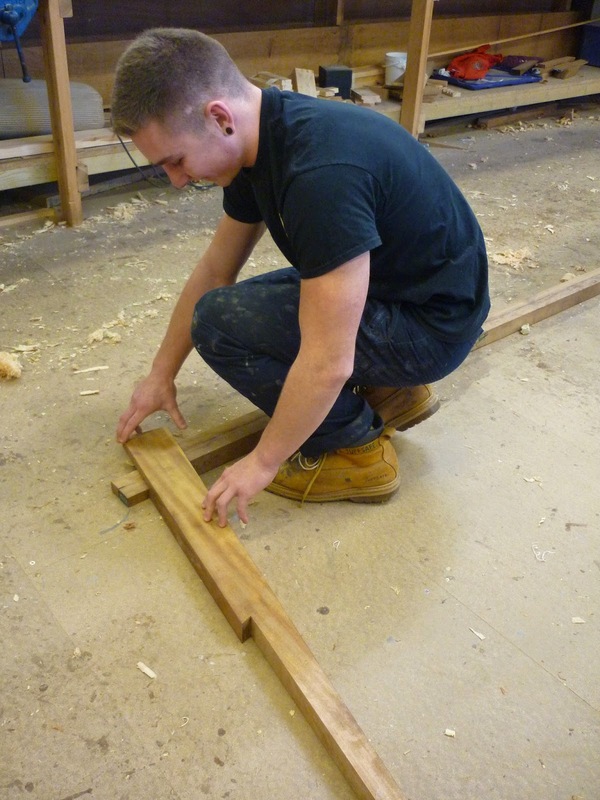 Aiden believes that he’s leading it as he started the job and made the keel. I believe that I am leading it as I have already made one backbone. Dunstan, the gig manager, has backed me up – much to Aiden's disgust. (Don't worry Aiden – it's your turn to be interviewed for the blog next month – JJ). 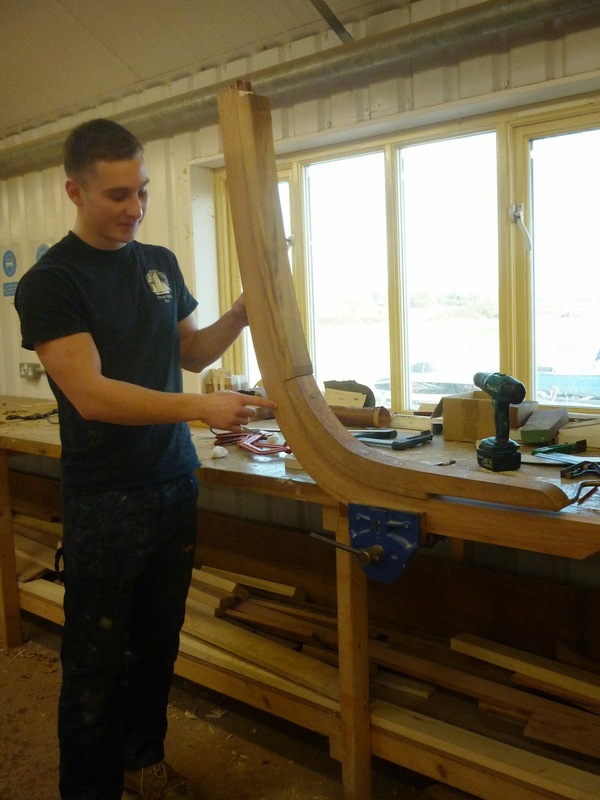 Jake: The backbone, for those of you who don't know, has nine different components: the stem, apron, forward knee, keel, hog, aft knee, deadwood, stern post and transom. The stem, forward knee and aft knee are all made from laminated mahogany, glued together on a jig. This is because they all have a large curve in them that would be hard to achieve from solid timber. 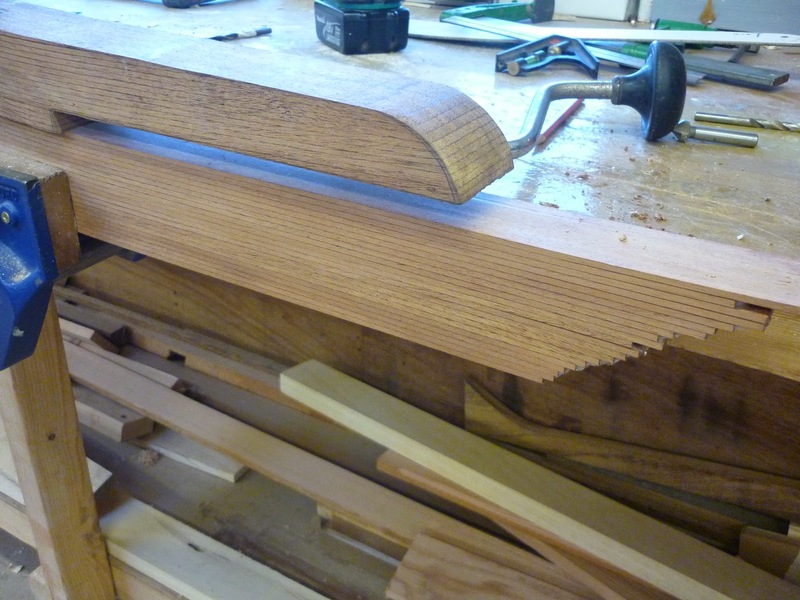 Jake: The apron, keel, deadwood, stern post and transom are all made from Iroko. This is the main wood that we use for making and fitting out the rowing gigs. Lastly the hog is made from Douglas Fir. The hog is the component that nearly all of the mahogany planks which we use in the gig hull are attached to. It's an important part to make correctly as it ensures that the shape of the hull is true. JJ You come from Dorking. 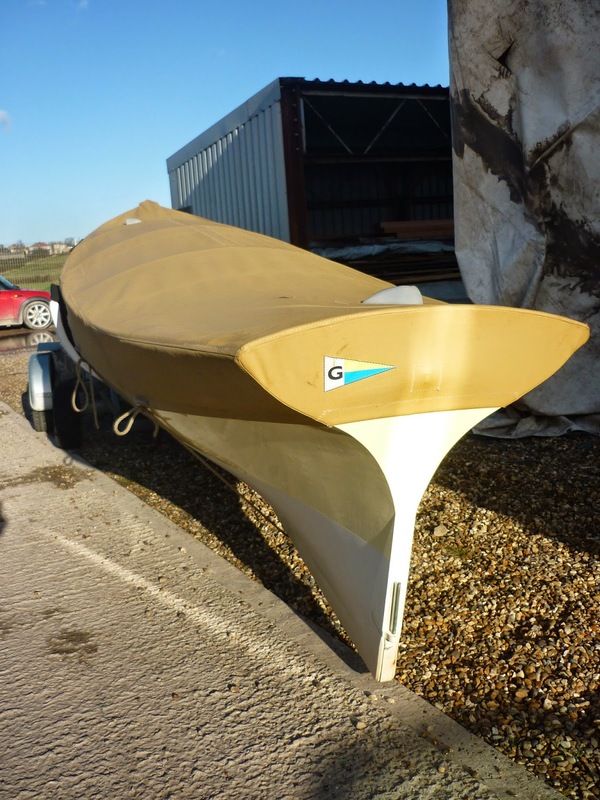 You'd never done any sailing so how did you arrive at Harker's Yard? Jake: I'm in my second year of my apprenticeship here at Pioneer and I arrived in an odd sort of way. 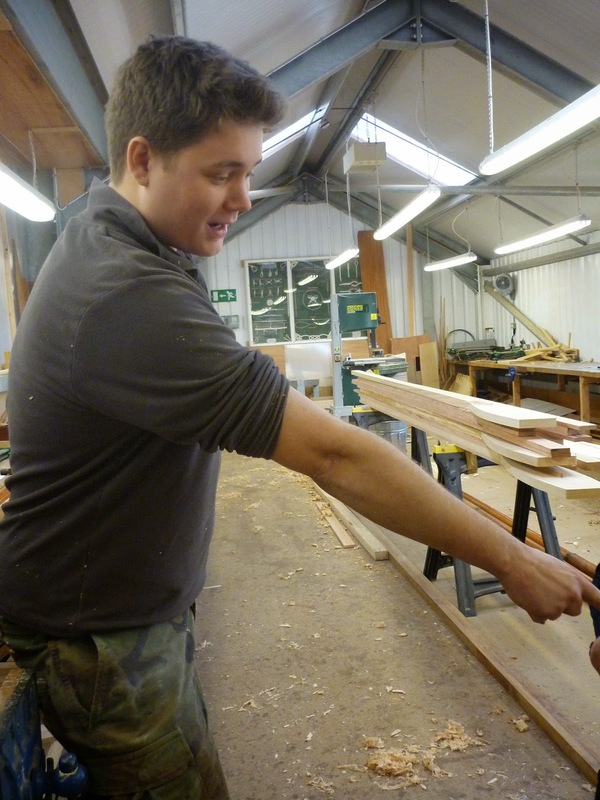 I left school after GCSEs and was at a college in Surrey doing carpentry and joinery at levels one and two. I wasn't really enjoying it very much as the teaching wasn't very good so I didn't want to stay for level three. I was looking around for alternatives but I wasn't having any luck. Suddenly my Nanny found an article in one of her women's magazines for a boat-building course in Devon. I got in touch with them but I found I wasn't eligible for some reason that I can't remember – I think it was that I didn't have my own boat. However they told me to get in touch with the Pioneer Sailing Trust which I did. I was invited for an interview, which just happened to be on the day I arrived back from a holiday in Turkey and soon after I heard back from them saying they would take me. I was extremely nervous at first. I'd been living inland in Surrey and I'd never even really thought about boats. After the first month of starting I knew I'd made an extremely good choice and I've learned more there that I ever did – or would ever have done – in college. Jake: I'll be finished at Pioneer in July and that's beginning to feel rather soon. I asked the owner of a boatyard in Turkey for advice on my next move and he told me to travel and get jobs in boatyards throughout the world. I might be a bit biased because I'm his Mum, but it's great to see exactly what Jake and the rest of the lads actually do at Pioneer. This blog is a brilliant idea. Some great photos on the website too. Well Melanie, you can be a bit biased and a bit proud of your young lad. He is doing well to be able to use both his hands and his head to create something of beauty and purpose. The boatyard owner in Turkey offered wise words. It worked for me and will work for Jake and if he turns up at our boatyard on the Gippsland Lakes, Victoria, Australia we will find him a job. For how long I can not say. But he will learn some stuff, earn a dollar and get to play with nice wooden boats.